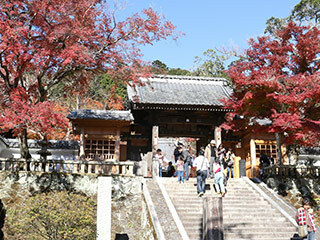 Koyo of Shuzenji Temple (修善寺の紅葉) is very famous in Izu Peninsula. Shuzenji is a temple located in Onsen town and during the beginning of December, it has a beautiful Autumn leaves inside and outside of the temple. Shuzenji is the Buddhism Temple located in the middle Izu peninsula. Priest Kukai established this temple in 807.It was used to be one of the top temple in Izu. In 1489, Hojo Soun supported to restore this temple.